All new boats include custom cherry oars as standard equipment. Our Adirondack Guideboat is internationally acclaimed as the world’s finest for its traditional hull design and space-age Kevlar composite construction process. We are not only selling these boats across the United States but worldwide including England, New Zealand, Sweden, Norway, Holland, Denmark, Scotland, Korea, Germany, France, and the Netherlands. This is a boat for clientele that want the traditional shape of the Adirondack Guideboat enhanced by the strength and low maintenance of composites. This is the boat that really launched our business. 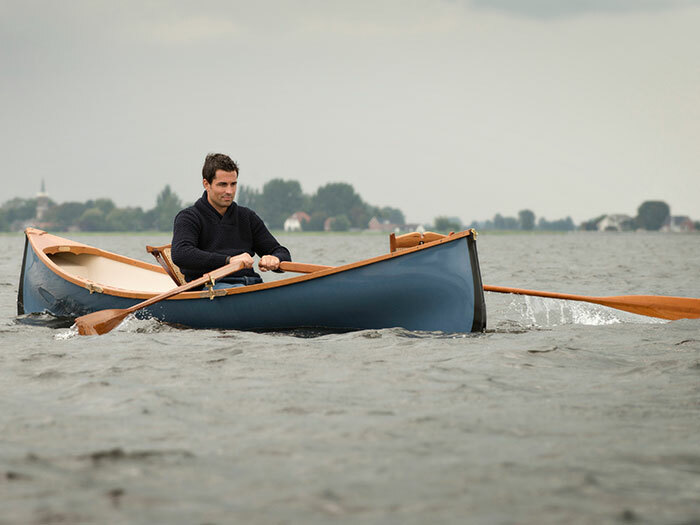 The boat hull is built with a Kevlar composite and trimmed with select cherry wood. The 15-foot Adirondack Guideboat includes three cherry caned seats, two maple oars, one cherry caned backrest for the stern seat, one cherry caned backrest with adjustable leather straps that moves between the bow and center seat, one cherry footrest, Okume floor boards, two sets of oarlocks and two Kevlar skid plates. Recently we were making a delivery in the Florida Keys­­… a rough job, but everybody has to be somewhere in February… where better than the Florida Keys? We shot some video footage of our Guideboat…. a new owner bringing his boat back to the dock for the first time. To the casual observer there isn’t anything interesting in this video. But boat-heads will easily see the boat’s relationship to the water. This new owner is barely doing anything… yet the liveliness of the boat is clear.